Roger Gibboni, the founder of Rogers High Fidelity, seems to be having way too much fun these days. During a conversation at the recent Rocky Mountain Audio Fest (RMAF) his passion for audio design came across loud and clear. He brings with him an extensive background in aerospace engineering, which is reflected in how his products are designed and manufactured. The 65V-1 is a perfect example. 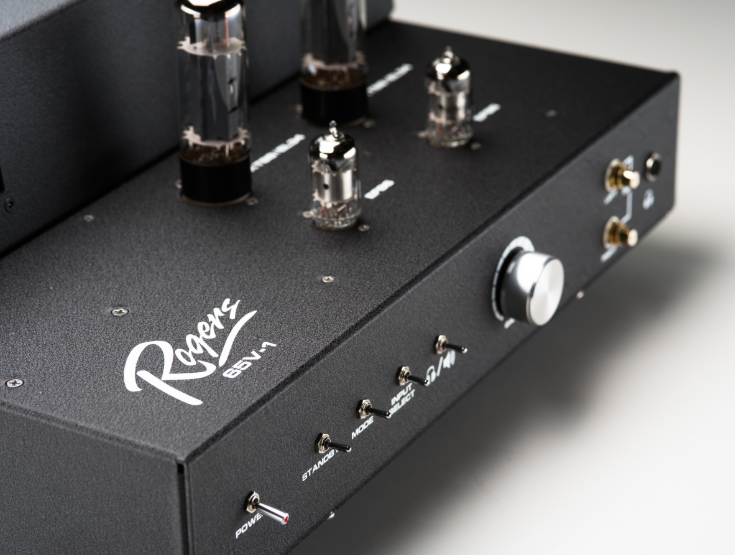 Although intended as an entry-level offering, it is definitely not a watered-down version of one of Rogers’ big push-pull amps. In fact, it’s something totally different—a single-ended design using one EL34 power pentode per channel, though upon request the amp can be shipped with a KT88 beam power tube. The design was driven by the challenge of arriving at a final product that sounded as good as a higher-priced Rogers amp, but at a price a young millennial buyer would consider attractive. Gibboni frames it rather delicately by pointing out that the demographic of well-heeled baby boomers is aging out—a trend I observed firsthand at RMAF, where a large fraction of the traffic was gray and bald. It stands to reason that if high end is to survive, new converts are desperately needed. According to Roger, market research indicates that to attract millennials, a product needs to not only compete on the basis of price but also be technically cool. I think that providing iOS app control of a single-ended tube amplifier qualifies as such. An iPad app is freely available from the Apple App Store that allows the user to control volume and operating mode (ultralinear or triode) and to change inputs remotely. Power output level is also on display. Communication is via Bluetooth, which explains the antenna connection on the back panel. Of course, full manual functionality is also available on the front panel. Measurement is a key element in the Rogers High Fidelity design and manufacturing process. Each piece of gear is burned in for 100 hours prior to shipment and then undergoes a battery of tests. I don’t recall, in my entire audio reviewing career, ever receiving a product accompanied by a comprehensive Audio Precision test report. But that is the level of rigor that Rogers undertakes in its production, and takes pride in the fact that its manufacturing process achieves greater than a 99.8% first-pass yield for acceptance testing after build completion. Perusing the test report, you will find a plot of power versus total harmonic distortion (THD). The number that jumped out at me was a power output of 10Wpc into an 8-ohm load at about 2% THD in ultralinear mode. The plate dissipation of an EL34 is 25 watts, so if it is biased hot you could eke out 12 watts of continuous power from a single EL34, though most designers would opt for no more than 10 watts. Curiously, that type of spec is nowhere to be found in the online promotional material or even in the owner’s manual—one of the main reasons being that Rogers is a firm believer in peak rather than continuous power. According to Gibboni, the ultimate goal is peak power performance, which is seen to be a major factor in making amps sound musical. I’m sympathetic to the notion of peak or music power, even though the specification has had a checkered history. (It was used in the 60s and 70s to inflate an amplifier’s power rating, before the U.S. government finally stepped in around 1974 to mandate continuous power ratings.) The main point is that music is not continuous by nature, and providing that a tone burst test is sufficiently long in duration (say 200 to 300 milliseconds, to overlap the attack and decay portions of a real-world transient), then such a test would more accurately predict an amp’s performance with music program material. However, for many high-end power amps with beefy power supplies this distinction is moot, as they deliver the same power level under any drive signal condition, either momentarily with a burst tone or continuously, and can be said to have no dynamic headroom. On the other hand, amps with a soft power supply can deliver significantly more power momentarily than they can continuously. In peak power, the 65V-1 is capable of being driven toward clipping while delivering on the order of 25Wpc at 10% THD. Please don’t roll eyes at 10% THD, as that’s the norm for any good single-ended power amp at maximum output. And you shouldn’t confuse even-order single-ended distortion with the odd-order distortion push-pull amps dish out. The former is consonant with music, while the latter is irritating to the ear even in minute quantities. Which would you rather listen to: 10% even-order or 1% odd-order distortion? For me this is a no-brainer. I’ll opt for tube lushness over tube brightness any day. The audio circuit is quite simple and consists of an EF86 small-signal pentode directly driving an EL34 or KT88 output tube—your choice. Cathode bias is used, which makes changing power tubes rather simple. A tad of feedback (2dB) is employed to flatten the frequency extremes. The EF86 was introduced in the late 1950s specifically for audio applications. It features huge gain (more than a 12AX7) and has found quite a following in guitar-amp applications, with aficionados raving about its sweet textures and full-bodied, caramel-colored tonality. I suspect that it is musical instrument usage that has kept this tube in production in Russia and by JJ Electronic. The tube is notorious for being microphonic, and Rogers takes care to test and select primo samples from new JJ Electronic production.